CUP FINAL TRAVEL UPDATE| All pre-booked supporters please arrive at the clubhouse at 1015 LATEST for a 1030 departure. Only pre-booked supporters will get on the bus. UPDATE | There are now no more spaces on the supporters bus to Bridgehaugh park leaving the club at 10.30am on Saturday 20 April. If you wish to travel to Stirling by other means we would very much appreciate your support. Tickets to the ground can be bought now from the 86 Queens Road clubhouse bar or on the day at Bridgehaugh park for £10. Over 60s for £5. Under 18s get free entry. 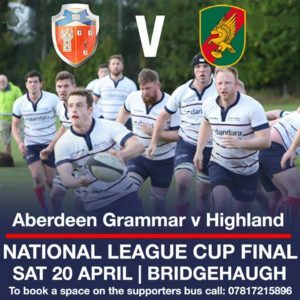 On Saturday, April 20 we take on Highland Rugby Club in the National League Cup Final at Bridgehaugh Park in Stirling. Kick-off is 3pm. Our 2XV will play Highland 2XV on the same ground with an earlier kick off at 1pm. There will be a supporters’ bus leaving at 10:30am from the clubhouse at 86 Queens Road. It is free to club members and £10 for non-members. If you fancy the trip, please book your seat on the bus by this Sunday 14th by calling Colin on 07817215895 or Fraser on 07908811270. Please note transport on the bus does not include a ticket for the game. Tickets can be bought from the club at 86 Queens Road or at Bridgehaugh for £10 for adults, £5 for over 60s and free for under 18s. We very much hope you can make it along to Stirling for a great club day out!